One of the scariest things about starting golf is knowing the etiquette. Breaking the etiquette rules can create a more explosive reaction from fellow players than breaking written rules of the game! 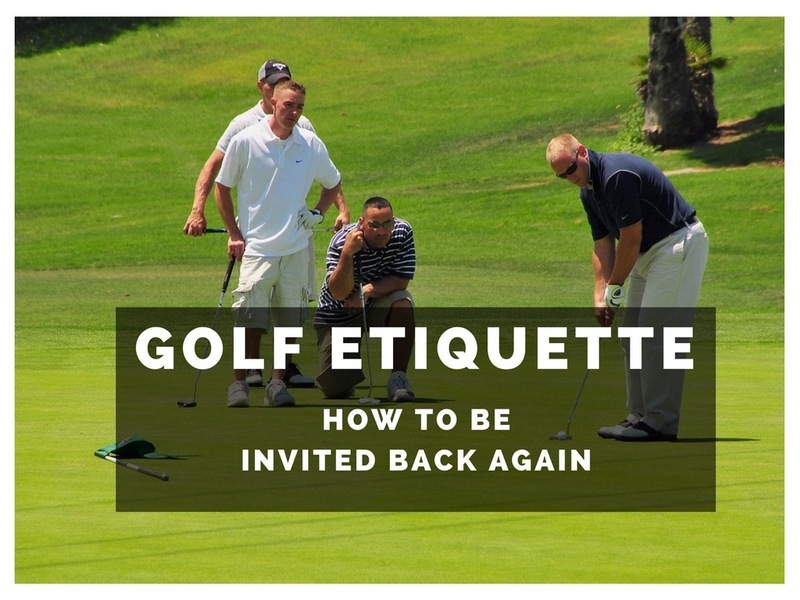 When I started playing golf 20 years ago, I broke every etiquette rule in the book. I learned quickly how to behave on the course after being lectured by more experienced golfers. You'll have a head start by reading this guide and like me, have etiquette breaches that bother you and others that don't. Leave your bag outside the clubhouse or pro shop. I don't know why, but that's how it goes. 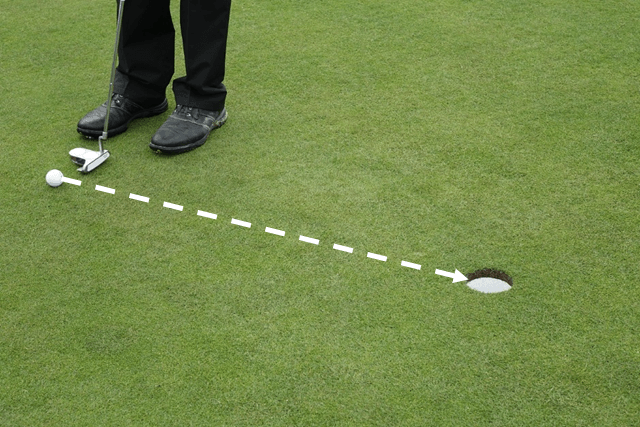 Be at the course 20-30 minutes before your tee time to pay, warm up and practice a few putts. 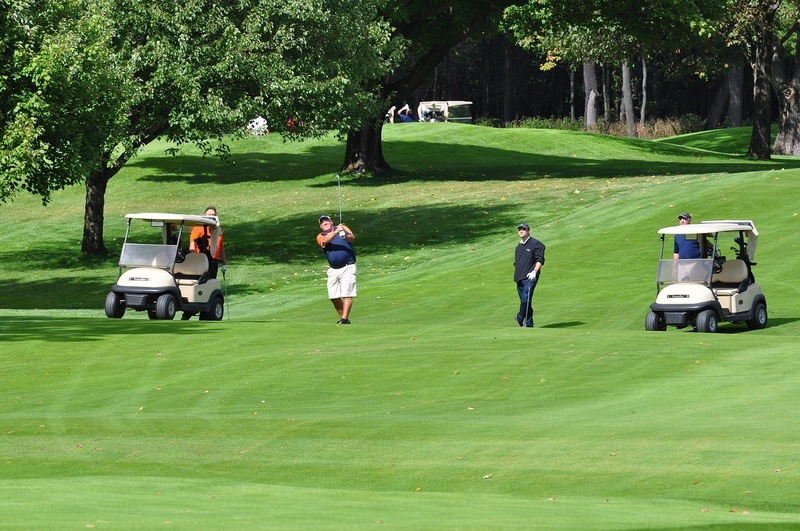 If you're late or don't show, you put your playing partners in a stressed state and spoils the beginning of their round. You also won't be invited back if you don't show. Don't cancel last minute. The only reason to cancel a golf game last minute is if you're dead. Otherwise, be there! If you're playing with strangers, walk up to the groups around the tee and ask what time they're playing. Once you find the group you're playing with, introduce yourself and shake everyone's hand. You can tell them if you're a new golfer - up to you. Make it a real mans hand shake and not a 'dead fish'. That's just not done. Whenever someone is playing a shot near you, it's best to keep quiet and stand dead still. Similar to how we react to our women when they've got a problem with our behavior. This includes the cell phone - on the golf course put it on total silence mode without vibration and leave it in the bag. If you have more important business than your golf game with buddies, you have your life priorities wrong! One of the most common irritants is when someone undoes their golf glove Velcro on your back swing. Do this along with pulling and putting clubs in the bag between other guys shots. You should develop a pre-shout routine but since you probably take a lot more strokes than a lot of golfers, make your routine short. One or two practice swings and set up to the ball and hit. Efficient golfers always get an invite to play, whereas slow golfers lose friends quickly! Regarding preparation before your shot, get things ready beforehand. While waiting for others to play, think about what club to hit - look at and gauge distance as you walk up to the ball. Pull the club out between other guys shots so when it's your turn you're ready to fire. Don't start the whole process only as it's your turn. You're going to miss a lot of greens and a lot of putts and hit some woolly and wild shots, and no one really cares if you do. We're all out there for fun and a chat with some boys anyway. But no amount of good personality can overcome a new golfer who stands in disbelief that he hit a bad shot, all the while holding up play. Keep moving, keep playing and remain positive and everyone will love you. There's no such thing as bad publicity they say. That's not true for golf courses. While Sergio likes to treat his shoes like a bad mule, you're not being paid millions for brand awareness of Taylormade. Word of your ill temper gets around a country club or golf club very quickly. Don't throw a club. Ever. Throw the whole bag in the lake if you like but never a single club toss - you will not be invited back. Don't swear and shout after every bad shot. One or two f-bombs are fine but one for every shot is too much. If you're having a bad day, start drinking. Don't take divots out of the ground or green in anger - not classy at all. Don't break clubs. Unless you break them all. Go all out or don't bother. Don't kill the vibe. Everyone's out there for fun or to escape their awful wife so let's keep it fun for everyone. Standing 45° over the golfers back shoulder is one of the worst places to stand. Very very distracting. Standing behind the golfers back isn't advisable if it's too close because he'll be wondering if his club will hit you. If it's more than 5 yards, it's generally okay. Always always always repair your divots in the fairways and always repair pitch marks on the greens. This is general common sense that so many golfers ignore or are ignorant to. Repairing the divots and pitch marks immediately significantly speeds up the regrowth process. Those brown pitch marks and divots you see? Lazy bastards who couldn't be bothered. In general, be quiet on others shots and congratulate them on their good shots with a 'good/great shot' comment. 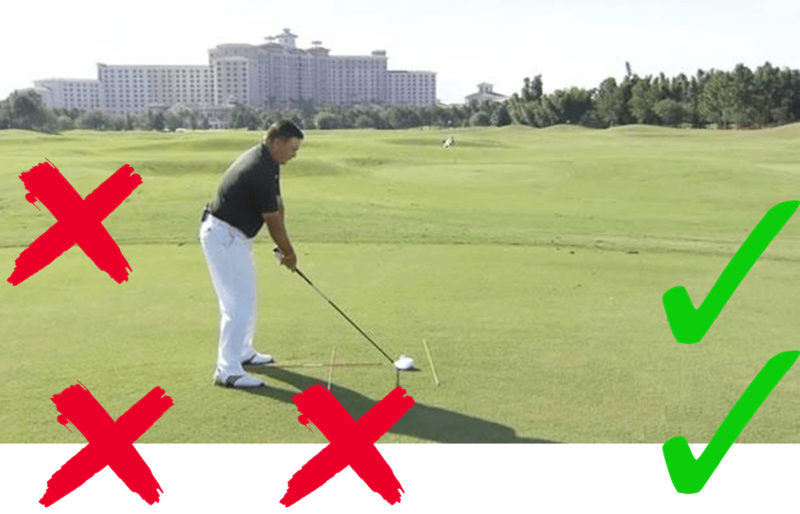 Don't give unsolicited swing/shot advice to other players as it's usually very unwelcome. If someone asks you what they're doing wrong, just say, 'looks good, maybe just relax and swing easy'. That's very generic and will usually stop them asking again. I once told someone after being asked what he should do to take a break for 2 weeks, then give the game up completely. I don't recommend this for making friends. Chat with everyone and don't be that weirdo who storms off in front of everyone or lags way in the back to avoid talking to people. I'm a single digit handicapper and have been for 15 years. I love all golfers especially newbies and high handicappers. We're all here to escape our miserable lives and wives so have some fun. If anyone is anti-fun, just never book a tee time with them again. Easy peasy. Don't hit if the people in front are reachable. If you hit it into people in front, apologize profusely. If they want to fight, roll up your sleeves and always pull an iron from the bag like a swashbuckler and swing it over your head like a mad man. I highly recommend the 7 iron. I never miss with a 7 iron. If they want your membership number to report your behavior, give them a fake one. I hit long bombs and am usually the designated driver assigned with hitting into the slow group in front of us. I've been asked my membership number (mainly by sour old women) countless times. I've never given them my actual number or name. I'm usually 'Steve' and my membership number is 3427. Don't be like me. Be better. If you hit a ball that is flying to where there are people, shout 'fore!' at the top of your lungs. Shout quick and shout loud! If you hit someone, prepare for dirty looks. If you hit a woman, prepare for soap opera level drama. The most romantic moment two heterosexual men can have on a golf course is finding another mans golf ball in the rough. The deeper the rough the higher the bromantic feeling you will develop. This is scientific fact. Find a place to stand as described above then be quiet until shots have been hit. A 'nice shot' comment is always welcome. Total silence is usually best for bad shots, but if you have some fun guys, a little ribbing or an 'ooooh' is OK. Judge it yourself. I won't be held responsible for your hospital fees. Usually the order of play is predicted by the lowest scorer on the previous hole. Playing first is called 'the honor'. TOP TIP: Only crack the pathetic "your honor, your honor" joke if you're a generally funny guy. Fake laughter always stings. Often though, guys play 'ready golf' which means if you're ready while the guy with the honor over you is fiddling around, hit before him to speed up play. One of the rudest things you can do is leave the teeing area before everyone has hit and start walking up to your ball along the side of the hole. This is a surefire way of getting the guys in the group to gossip about you while you're playing! Unless the rest of the guys are jerks, stand and watch the other guys shots. I don't really mind this because the greens are usually torn up from a lot of use anyway but I do mind on anything inside 6 feet. Try not to stand on other players lines - basically any piece of grass on a straight line between the golf ball and the hole. Looking after the course keeps it in pristine condition and makes the green-keepers job much easier. Grass on greens heal much quicker when pitch marks are repaired within a couple of minutes than if left unattended. Unattended marks go brown and cause scarring which looks awful. Use a pitch mark repairer, pocket knife blade or tee peg. Just use something. Fix these marks as soon as possible! 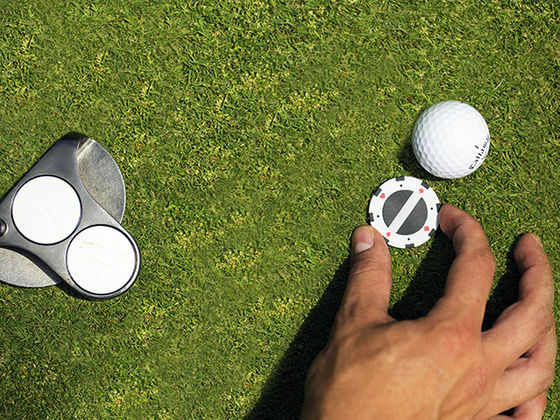 Use a coin to mark your ball or something equally flat. If it's not on anyone's line, I use beer cans, the toe of my putter, a tee peg and sometimes. If your ball is in someones line of sight, best to use a coin. Be conscious of where your shadow is cast especially early mornings and late afternoons. Try not to have your shadow touch the golfers putting line. They'll usually say 'watch your shadow' so this isn't a punch-up worthy error. When another guy is putting, if you're the closest to the pin on the green, hold the flag for other guys' lag putts after you've marked your ball. Inside of 20 feet, just pull the pin and set it down next to the green. There's only been one guy in 20 years I haven't shaken hands with. Not only did he break every single etiquette guideline in the book, he didn't even bother shaking hands and went directly home. Always offer a handshake and a 'thanks, that was fun' or 'thank you, I really enjoyed that'. If it wasn't actually fun, shake hands and say thanks and add in an excuse to leave early so you don't have to stay for a drink. It's often traditional to stay and have a drink with the guys you play with after the round. You can have a shower or not, but drinking will only occur after everyone's arrived. I need to watch my son's (insert seasonal sport) game. Even if you don't have a son. Literally anything believable will work. It's all in the delivery. Don't let your voice quiver and look them directly in the eyes. This is an old tradition and might not be in effect everywhere you go. 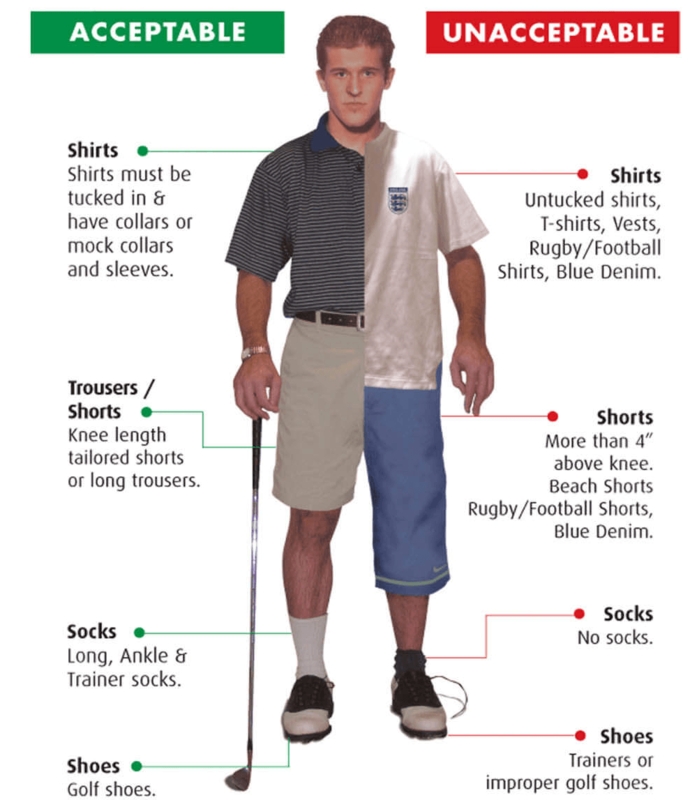 Best to take it off when entering the clubhouse or bar anyway otherwise you might get told to buy the whole bar a round of drinks!! !